The construction industry in Canada is booming, which means new jobs are being created every single day. With so many people entering this sector, it’s more important than ever to recognize the common risks that can exist on job sites. It may shock you that the construction industry has the highest number of workplace injuries a year when compared to other sectors – in 2016 alone, there were 4,595 lost time claims! Falls, noise exposure, improper personal protective equipment, exposure to hazardous materials and a lack of training all contribute to daily risks. The first step to preventing potentially life-threatening incidents is to recognize the risks. 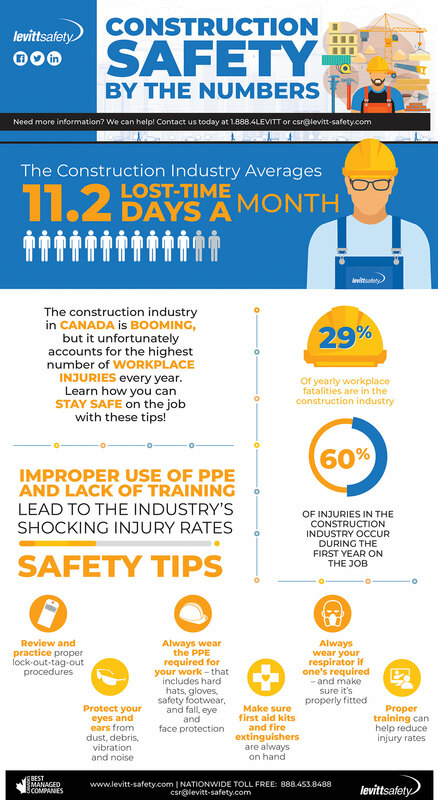 Take a look at some of the shocking construction industry safety stats you may not be aware of and find some tips on how to keep your people and job site safe. You may think safety is common sense, but a lack of awareness and preparation could end up costing you time, money and most importantly, the safety of your workers. For more information on what you need to keep your job site safe and fully compliant, contact us today to learn about our free on-site safety audits. Want to print a copy for your workplace? You can find the PDF here.